CENTRAL PA RACING SCENE: THREE FEATURES WITH THREE LAST LAP PASSES FOR THE WIN; Victories go to Freddie Rahmer, Troy Wagaman Jr. and Billy Brian Jr.
THREE FEATURES WITH THREE LAST LAP PASSES FOR THE WIN; Victories go to Freddie Rahmer, Troy Wagaman Jr. and Billy Brian Jr.
Abbottstown, PA (April 6, 2019) – Freddie Rahmer made it two in a row with his victory at Lincoln Speedway on Saturday night. Trey Hivner and Cole Young shared the front row with Hivner on the pole. Tyler Esh and Dan Shetler made up the second row. Hivner and Young made contact on the start. As a result of the bumping on the front row, Young made contact with Esh sending him into the wall. Esh came back down the track on the front stretch hitting Adam Wilt and then collecting TJ Dehaven as they tumbled down the front stretch. Esh landed on his side with Dehaven’s car sitting up on its tail-end. All drives were able to walk away from the crash. After the red flag the field lined up for a complete restart. This time the front row made a clean start with Young staying on the high line around the track to lead lap 1. Brian Montieth made his way up to second from his fourth starting spot on lap 2. Young had half a straight-away lead over Montieth before Brian started to reel him in. Montieth tried the bottom in turns 3 and 4 on lap 6 but couldn’t make the pass. It didn’t take long after that for Montieth to take the lead, he passed Young in turns 1 and 2 on the next lap to find himself in the front of the field. As Montieth was battling for first, Rahmer had made his way up to third from his ninth starting spot by lap eight. Rahmer got under Young on lap 9 in turns 1 and 2 to take second. Montieth hit lapped traffic on lap 12. 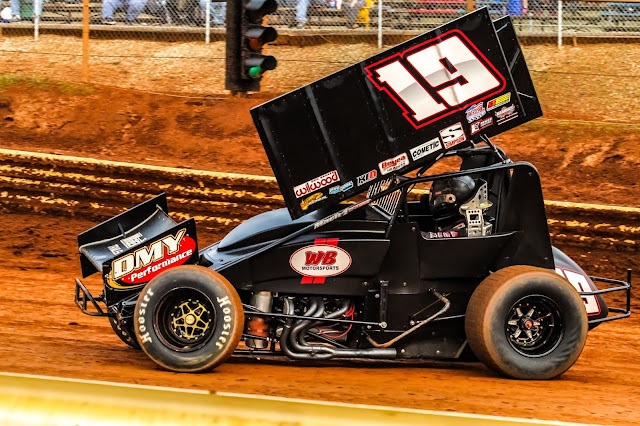 Alan Krimes was up to fourth on lap 13 from his sixth starting spot. Montieth was able to keep two lapped cars between himself and Rahmer as Freddie struggled to get around the lapped car of Landon Myers. After getting around Myers, Rahmer was starting to close the gap between him and Montieth when the caution came out on lap 21 for Young and Jim Siegel going into turn 3. Young had been running fourth when he got caught up with Siegel who was running fifth. Both cars were unable to rejoin the field. Rahmer got his nose under Monteith in turns 1 and 2 on the restart but was not able to complete the pass. The final caution of the race came out on the restart when Brett Michalski and Rodney Westhafer got together in turn 1. Freddie stayed with Brian on the restart, not letting him get to far out ahead. Rahmer nearly pulled off a slide job for the lead in turns 3 and 4 on lap 23. After coming out of turn 2 on the last lap, Rahmer made the pass for the lead on the back stretch and held off Monteith through turns 3 and 4 to beat him to the flag stand by .155 seconds. Alan Krimes crossed the line third. Dan Shetler finished fourth and Tim Glatfelter completed the top five. 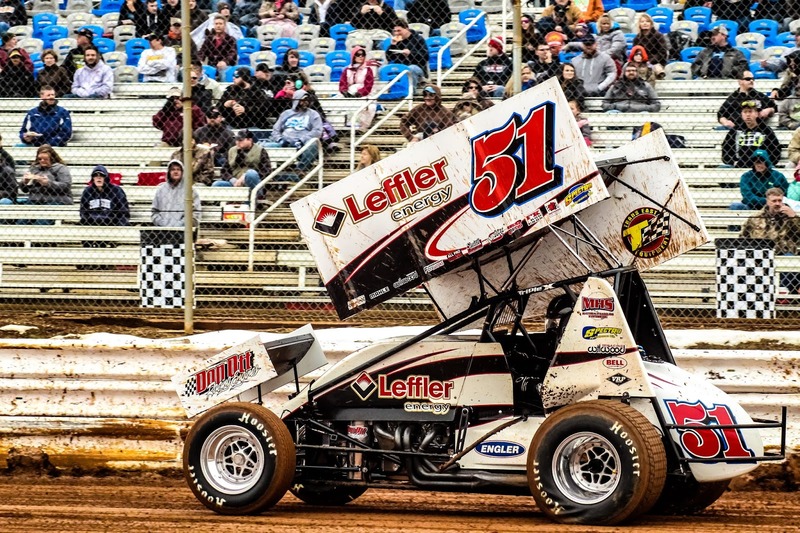 Rahmer’s win on Saturday made him the first repeat winner in the 410 division at Lincoln Speedway in 2019. 410 Sprint Car heat winners were Brian Montieth, Cole Young and Tyler Esh. Zach Allman was slated to start on the pole of the feature but stopped on the back stretch while the field was lining up. Allman was not able to rejoin the field. Allman’s misfortune moved Wyatt Hinkle into the pole position with Alyson Dietz starting second. Dietz took the lead coming out of turn 2 to lead lap 1. Hinkle stayed wheel to wheel with Dietz on the next lap beating her to the flag stand to take the lead. Troy Wagaman Jr. was up to third from his sixth starting spot when Hinkle took the lead. The first caution of the race came on lap 4 for Travis Scott in turn 4 when he got turned around holding off a charging Jeff Halligan for fourth. Scott was able to rejoin the field. Hinkle got out to the lead on the restart with Wagaman and Dietz battling for second. Wagaman tried the high side to get around Dietz on the restart to no avail. Wagaman made the pass for second on the next lap, lap 6. The final caution of the race came out on lap 9 for Kenny Kuhn and Nick Palmerino in turn 2. Halligan got under Dietz in turns 1 and 2 on the restart to take third. Doug Hammaker followed suit to take fourth, shuffling Dietz back to fifth. The top six cars started to pull away from the rest of the field. The leaders hit lapped traffic on lap 16. As Hinkle worked his way around lapped cars Wagaman was able to chase him down. Wagaman made the winning pass in turns 1 and 2 on the last lap. Wagaman held off Hinkle and beat him to the flag stand by .370 seconds. Halligan finished third. Hammaker was fourth and Tyler Walton completes your top five. 358 Sprint heats were won by Zach Allman, Alyson Dietz and Jeff Halligan. Billy Brian Jr. is no stranger to Lincoln Speedway. Brian won the 410 Track Championship in 1995 and won a World of Outlaws race at the track in 1993. Brian started on the pole with Joey Biasi to his outside. Brian got out to the lead at the start of the race, but the caution came out before the first lap could be completed. John Sullivan came to a stop in turn 4. Brian held onto the lead again on the complete restart. Drevicki was up to third from his fifth starting spot on lap 2. Drevicki started to go to work on Biasi for second and nearly got him as they drag raced to the flag stand on lap 3. Drevicki made the pass for second on the next lap in turns 1 and 2. Carmen Perigo Jr. started the race fourth and got shuffled to fifth at the start. Perigo regained the fourth spot on lap 6 and tracked down Biasi in two laps to take third on lap 8. The caution came out on lap 9 for Ryan Rutz in turns 3 and 4. The top three pulled away form the field as a 4-way battle got underway for fourth between Todd Leonard, Tony Jackson, Steve Wilbur and Joey Biasi. Drevicki was working hard on Brian for the top spot. The two drivers were drag racing to the flag stand for the lead when the caution came out on lap 14 for Tony Hampton in turn 1. Perigo went to the top line on the restart and nearly took second from Drevicki. Wilbur was up to fourth on lap 17 from his eighth starting spot. Brian and Drevicki pulled away form the field to battle for first. Drevicki got his nose under Brian on lap 20 as they raced down the back stretch but didn’t complete the pass. When they made it to the flag stand on lap 22 Drevicki had a .026 advantage over Brian. Brian got the lead back from Drevicki coming out of turn 2 on lap 23 and held him off to lead the lap. The leaders hit lapped traffic going into turn 1 with two laps to go. A lapped car allowed Drevicki to take the lead back in turns 1 and 2. Drevicki took the white flag with the lead and Brian right behind him. Brian went to the bottom of the track to pass his team mate, Drevicki, and caught his left rear just enough to turn him sideways. Drevicki was able to keep his car moving preventing another caution. Brian kept his car straight and went on to take the checkered flag by 1.674 seconds over Perigo Jr. Wilbur crossed the line third. Tony Jackson finished fourth and Drevicki held on to finish fifth. Wingless Super Sportsman heat winners were Billy Brian Jr., Steve Drevicki and Carmen Perigo Jr.
Next Saturday, April 13, Lincoln Speedway is back in action with 410 & 358 Sprint Cars and USAC East Coast Sprint Cars. Racing starts at 7PM with pit gates opening at 4:30PM and grandstand gates opening at 5PM.